Smithers Division, Skeena Subdivision, Mile Post 102.2, September 27, 1958. Crews are working in continuing danger of further earth movement, as they struggle to free SW1200RS’s 1271, and 1276. The passenger cars had remained upright, with no more than a few bumps and bruises amongst the passengers. 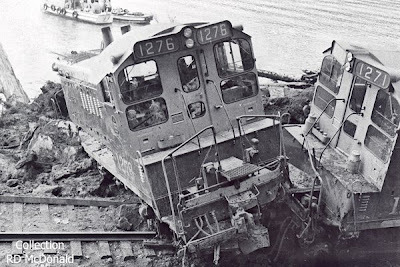 The cars had been towed back to the station at Prince Rupert. The steam generator car had also remained upright, but had to be dug out of the rocks, muck and mud. She was removed to Sockeye Cannery siding, and now the Lidgerwood has access to the CNR 1271. Shortly after she was cleared away, another movement of earth descended upon the 1276, burying her almost up to the cab deck. As I mentioned before, this subdivision is no stranger to slides from the unstable older rock adjacent to the mainline, and flooding resulting in washouts from the Skeena River on the opposite side. 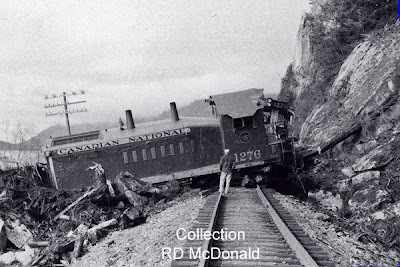 On the rail line between Prince Rupert-Pacific, over 30 slides (12 of which major ones) and washouts occurred, cutting the rail and wire lines. The 80-mi. (128 km) stretch of track between Pacific-Skeena was impassable. Two work trains with Buildings and Bridges and extra gangs, pile driver, and dragline were dispatched from Smithers. The worst washout was just west of Kwinitsa. 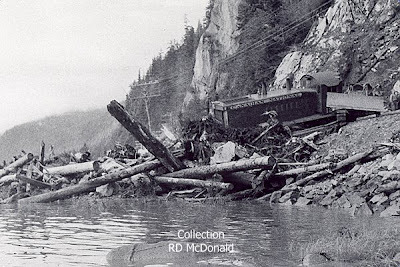 An eastbound passenger train, an American Army Troop train with the last contingent of 141 returning soldiers, got caught between two rockslides at Salvus for two days. All the available equipment and some 250 men were set in to clear the tracks. On November 3, a washout occurred at Mile 36.3 (Marble Creek?). The CNR alleged the washout was caused by the blocking of a stream channel under the highway bridge, approximately 800 ft. (240 m) upstream from the railway. 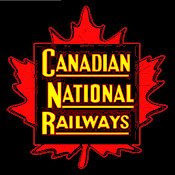 Consequently the railway company submitted a claim in connection with the washout at Mile 36.3 (Mills). The movement of repair crews and equipment was delayed by the derailment of an auxiliary train. The ditcher, oil car, and caboose derailed near Kaien. During clearing operations a few miles west of Pacific, a large 40-ft. (12 m) crane went over the bank and ended up at the edge of the Skeena River. On November 23, the train service was back to normal, after an interruption of 10 days. The heaviest damage occurred between Remo-Kwinitsa, with six slides and the approaches to six bridges washed out. Between Remo-Shames, there were at least 12 washouts, some being 12-15 ft. (3.6-4.5 m) deep. At Kwinitsa, a washout occurred east of the tunnel. Two smaller slides came down between Exstew-Salvus. A washout and a large debris slide measuring over 200 ft. (60 m) happened at Amsbury, at the same location as the one that occurred on October 13. The Zymacord River bridge got washed out. In Remo, about 0.25 mi. (400 m) west of the Kitsumkalum bridge, a washout occurred, measuring a length of 300 ft. (90 m) and a depth of 10 ft. (3 m). The piling at the northeast end and both the approaches of the Shames River bridge washed away, tilting the bridge. The repairs were hampered by heavy snow. On December 5, the Public Works Department was still trying to reopen the highway. To repair the bridge at Shames, a pile driver was brought down from Smithers. On December 12, however, the Public Works officials warned people not to be too hopeful about an early reopening of the highway between Terrace-Prince Rupert. The only major repairs left to be done were at the slide at Amsbury and the Shames River bridge. On December 3, a road crew under foreman E.P. Smith reached a point about 1.5 mi. (2.4 km) east of Salvus, and expected to reach Shames River by December 6 or 7. On December 21 the road was passable between Kwinitsa and the Shames bridge. 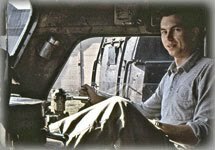 The rental of an U.S. Army Services D-4 Caterpillar tractor and labor for the period November 6 to December 8 amounted to $1,267.43. On February 16, 1946, the road to Shames was opened. The bridge crew started working on it again on February 18. George Little's tractor was employed to remove the log jam under the bridge. On March 28, most of the repairs were completed, except for the rockfill around the piers and placement of the river back in its original course. There was still a considerable amount of debris under the approach trestle." That was then, this is now. 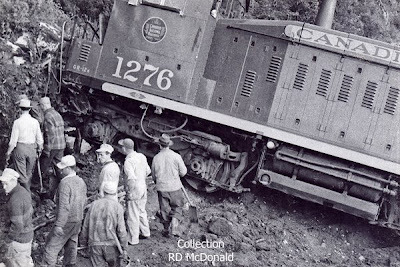 Finally a cat is able to clear the second slide from behind CNR 1276, and punch through the upstream end of the slide. Once again, the Lidgerwood will work it’s magic, and pull the CNR 1276 up the embankment onto the replaced roadbed. Remarkably, this crew had the line up and running again, a mere 16 hours after the incident began. But then they got a lot of practice on this subdivision! Thank you for a further part. It was interesting reading the Newspaper Story about the washout from 1945.